The use of facial scanning is becoming commonplace — maybe you’ve heard of the new iPhone? It’s also coming to an airport near you. At the Orlando International Airport, Britain-bound passengers — some wearing Mickey Mouse T-shirts and other Disney paraphernalia — lined up at Gate 80 recently for the evening British Airways flight to London’s Gatwick Airport. It looks like any other airport departure area, except for the two small gates with what look like small boxes on posts next to them. Those boxes are actually cameras. They were installed earlier this month by SITA, the Geneva-based company that develops information technology for the world’s airlines, in conjunction with British Airways and U.S. Customs and Border Protection, or CBP. If things don’t match, the travelers’ passport is scanned manually by a gate agent. CBP is testing biometric scanning at a dozen or so U.S. international airports to ensure that people leaving the country are who they say they are, and to prevent visa overstays. 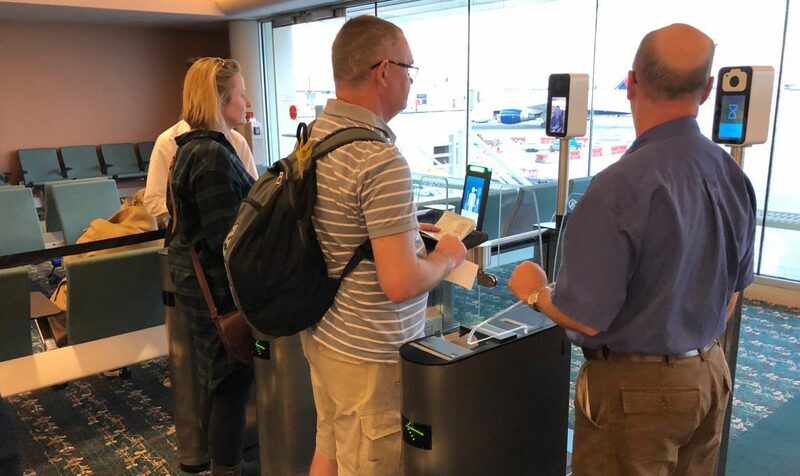 The Transportation Security Administration, another agency within the Department of Homeland Security, is testing similar devices at security check-in lines. Steve Karoly, acting assistant administrator at TSA, calls the use of biometrics “a game changer” for the aviation security. “It will make things a little bit easier, more efficient at an airport environment,” he says. Karoly predicts it will be a few more years before biometrics are in widespread use by TSA. Among the problems he cites is bias. “DHS doesn’t seem to know whether its system will falsely reject folks,” that is, be unable to match the face scan with photos it has in the system, at higher rates because of their race or gender. “That’s a serious problem,” he says. According to a report by the CAPA-Centre for Aviation, face-recognition software “is not so good at identifying ethnic minorities when most of the subjects used in training the technology were from the majority group.” Another problem are passengers who are wearing glasses, hats or scarves. Rudolph says about 4 percent of travelers are wrongly rejected by the system. Many travelers in Orlando whom NPR spoke with said they were happy with the process, although there was some grumbling by those at the end of the boarding queue. Comfortable or not, travelers should probably get used to the technology. President Trump signed an executive action last year urging the government to speed up the airport use of biometric tracking, and CBP hopes to have face scanners installed at all the nation’s airports in four years.